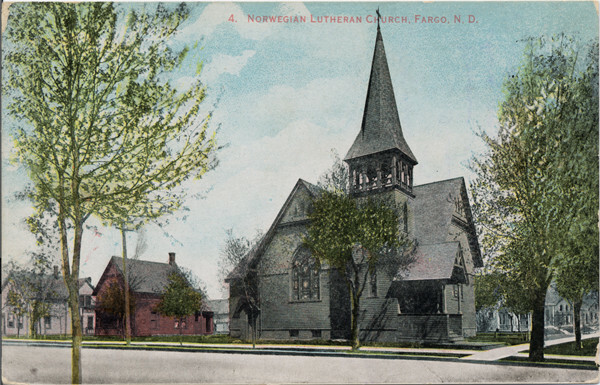 The building was first built as the First Norwegian Evangelical Lutheran Church, cornerstone being having been built in May 26, 1895. It was designed by the Hancock brothers, George nd Walter, and served as a church until about 1919, when it was removed and replaced by a funeral home [Courtesy of the North Dakota State University Archives]. Like other religious groups, Lutherans populated the landscape in large numbers, which brought about the need for a communal place of worship. Members established a church in which they aptly named First Lutheran Church, located in the area of 400 Roberts Street. The church was built with an open porch and there were several wooden homes built next to this church. As with most of the other early religious structures, the main and most noticeable consistency was the very large and high steeple; it is as if the churches were made to be seen stretching into the heavens. This church is different from others in that that it was built with an outer decor consisting of wood frame. This picture also shows that the surrounding residences were made of both wood and brick, thereby indicating that the skills and trades of many populations were getting supplies from both river and rail. Most likely, the wood came from mills in Minnesota. Judging by the original land plot and other historical records, R.L. Frazee in Frazee, Minnesota, was dedicated to producing lumber and turned out building supplies that was eventually loaded to rail for the west. Some of the wood later would be committed to the United States Government to build the First Pony Express as the rails pushed West. In summary, the first people to form the new community of Fargo were rich in both tradition and a history that they brought from many points of origin all over the world. With immigration to Fargo also came the traditional beliefs that resonate within each culture and also made a permanent mark on the surrounding community. Rich with tradition and deep in history, the community of Fargo grew into a stable and robust community greatly influenced by the cultural diversity of immigration and migration. With diversity came the freedom of religion. The early settlers held the ideals of western movement and ultimately established a similar base of faith and beliefs that grew quickly and expanded the country from coast to coast; faith and religion were very important in each and every landscape that marked progression from the Fargo area to the Puget Sound. As testaments to the faiths that motivated early settlers, their beliefs never faltered and many of the early churches still carry on the traditions of their interpretation of religious and today’s skyline still holds their steeples in our prayers and in the community’s sites.